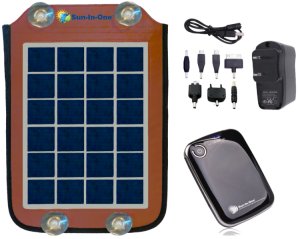 The 5 Watt Solar Cell phone charger has a stand so you can point it to the sun any where you are like camping or fishing. The Sun-In-One 5 watt cell phone charger also has pockets on the back so that the 5200 power pack battery that is detachable can be stored while charging. This unit is great for on the go or in case you have power outages from storms. This 5 watt solar cell phone charge charges almost an amp and hour so most cell phones are fully charged in under 2 hours. The Once your fully charged the power pack you can take it with you and have portable power with you all day long. 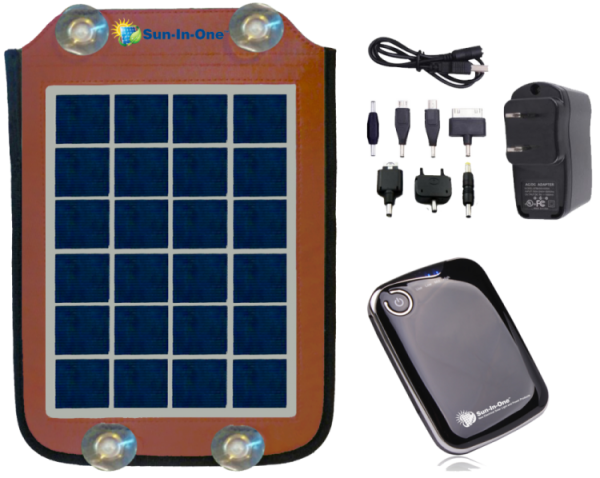 Be ready for the next power outage with Sun-In-One’s 5 Watt Solar cell Phone charger.